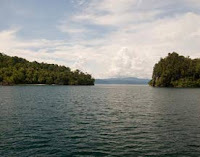 Kaimana city, West Papua not only have its lengendary song “Senja di Kaimana” but also has gracious sea view. So, if you want to enjoy the pleasure of beach and sea, you don’t have to go far away to Hawaii. Come to Kaimana. One of the tourists object is Triton bay. From Kaimana to Triton bay is very easy, only takes 1.5 hours trip. After pass the Bicari cape, you’ll find Namatota strain (also known askami Erana strain) and Namatota island. Here you can see very wonderful scenery, a mountain with whale shaped. Inside it, you’ll find many picture, sun, human palm and scull. Origin people consider this place as sacred place and they don’t know for sure when those pictures made. This island has lots of mystery. Every 8.00-12.00 am (local time), if the weather good and the sea calm, you can see a herd of whales and dolphins looking for food and they are very active with their groups. This place was “fishing bank” for the whales, dolphin and other fish. Tourists also can see Mangiwang fish or “stupid shark”. They called it stupid because they walk through the sand using their fin and eat infant shrimp. This place is very suitable for diving and snorkeling lovers. Triton’s coral also famous for its soft coral. CI Kaimana survey found 868 species of coral fish, include 10-14 new species (10-13 endemic). You can find the biological variety by : 959 species of FakFak/Kaimana coral fish, bank heal seascape (BHS) 1,323 species (24 endemic). FakFak/Kaimana coral 471 species, plus 16 new species and BHS 560 species and Mantis FakFak/Kaimana shrimp, 28 species and BHS 57species (8 endemic). And for the coral reef fish diversity index, predicted about 1,194 species of coral fish at Fakfak, Kaimana. 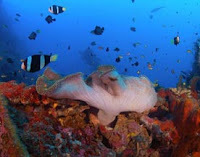 Besides, there are, 234 species for coral sea categorized as foodfish target, Comercially or traditionally. For comperation, Thailand only have 174 spesies of coral fish. 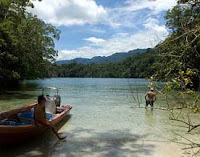 Coz of the variety of the fish, this place also suitable for fishing. Triton bay also have legend suh as The sinking of China ship Ming dynasty and England ship. Your journey will be more joyful to Umbrom island. You can swim in here, the sand is white. Not far from Umbrom island, you can find Kelelawar island (Bat island), They called it because when the sun start to disappear, thousand bats come out from their nest, then fly to Kaimana city. To keep Triton bay and Kaimana sea everlasting, Kaimana local government establish an area for 597,747 hectares (counted four miles from sea coast) as Kawasan Konservasi Laut Daerah (KKLD) or Sea Conservation Region. As young generation have to support and help every government program to protect our environment.